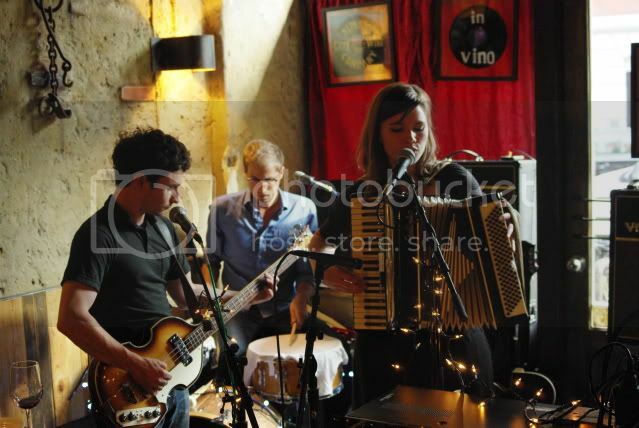 The latest installment of the outstanding music and wine concert series Vivo In Vino featured the music of Savoir Adore. Two Sundays ago, the Brooklyn-based dream/indie pop band performed a tight hour-long set featuring songs from their excellent debut album In The Wooded Forest and several new songs. The sumptuous harmonies of lead guitarist Paul Hammer and guitarist/accordionist Deidre Muro were perfectly fit for the intimate In Vino surroundings. Highlights included the high energy encore of “Bodies”, new song “Loveliest Creature”, and non-album track “Sparrow” (streaming below). From our vantage point at the front of the stage, Savoir Adore was a pleasure to behold — expect to see much more of them on nyctaper. I recorded this set with the DPA microphones at the front of the stage and directed at the rhythm section (right channel) and lead guitar (right channel). The microphone recording is mixed with a feed from the soundboard (vocals and accordion) and all four channels were balanced in post-production. The result is a superb capture of this intimate show. Enjoy! Great band, great recording. I downloaded the show after I saw it here. Enjoyed it, and bought their latest record. Thanks for the new find!